An Ohio man wonders if the souvenirs collected by his uncle while stationed on the U.S.S. Indianapolis during World War II could possibly be remnants of one of Japan’s famous kamikaze attacks. While home on leave, the uncle shared a story with his family about a kamikaze attack on his cruiser. Sadly, when the uncle returned to duty, he was killed when the U.S.S. Indianapolis was torpedoed during the final weeks of World War II. Inside a cedar chest, his family found some mementos he’d brought home when he was on leave. 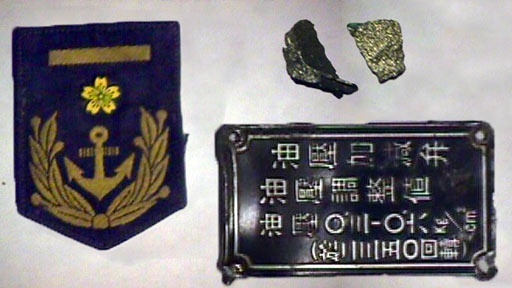 They included a Japanese metal sign, military patches and a piece of mangled metal. History Detectives goes to Ohio to take a closer look at these souvenirs of war and see if they're related to a kamikaze pilot’s attack. Along the way, they learn more about the fascinating and tragic history of the U.S.S. Indianapolis, the cruiser at the center of the worst sea disaster in U.S. Naval history. Also with Wes Cowan Bonus Army Stamp Is this stamp connected to a moment when the U.S. Army fought fellow soldiers in the nation’s capital? Also with Wes Cowan Civil War Balloon Could this piece of frayed material be from the country's first military airship? Also in Depression and WWII: 1929-1945 Hitler Films Could these rusting film canisters contain unknown footage of one of the 20th century's most heinous murderers? Also with Wes Cowan Lafitte's Spyglass Did this spyglass really belong to a fearless cutthroat pirate? Also in Depression and WWII: 1929-1945 32' Ford Roadster Was this car among the popular hot rods that raced out at the dry lakes in the 1930s? Also in Depression and WWII: 1929-1945 Seadrome Did floating airports dot the Atlantic before modern air travel?